The blizzard sequence is reason alone to start watching if you’re not already. And just a note: I’ve been putting off writing about what happened in Santa Barbara because the meta analyses are so confusing and I’m having a hard time figuring out what I think about it. Maybe my Santa Barbara readers will help me out by commenting. This entry was posted in Television, Top news and tagged Fargo, Santa Barbara murders. Bookmark the permalink. Numb–that’s how I felt for several days. Then I realized that I was remembering my own horror when my brother died and that it was 40 years ago this September. It was no mass murder; it was suicide. But after I watched the videotape by Rodger I noted the similarities with my brother–lonely, not fitting in, somewhat isolated, unable to hold a job, mental health diagnosis….He didn’t hate anyone else, didn’t hate himself, just couldn’t see a way forward on his own. I feel for Rodger’s family–all the efforts they made–even buying him a BMW couldn’t make life work for him. And they apparently stayed in touch with him and provided therapy–they hadn’t given up on him. Last week there was no news except the Isla Vista news all weekend on our local TV channel. They even cut into the national 5:30 newscast with the sheriff’s statement Saturday evening. I was most impressed, though, with the students’ memorials: there was a “paddle out” on Wednesday evening and there are chalk drawings all over the street in front of the dell where the young man was killed. The paddle out included kayaks, boogie boards, and surf boards–a couple hundred or so going out past the surf in Isla Vista. They form a large circle, say a few words, and toss flowers in the water. The news photos didn’t do it justice and it’s so California; done for surfers who have died here. The chalk drawings are just charming–the kids are taking their community back. They’ve even written notes to journalists to leave them alone now. But what do we have with this. I was incredulous to learn Saturday about the slashings of the roommates–how planned this massacre was. Part of this is due to our culture–what we teach our boys they should be. Part is our guns–our right to arms. Maybe we could change that right to one that guarantees our right to good health and good care (mental and physical)–or is that already one of the rights? Part is our system of caring for people with mental illness–we just don’t have it right yet. I worked in and around mental health organizations for 30 years–I know that some things have improved, but it’s not all together yet. They’re/we’re still dying from it. Jumping from the personal to “what does this mean for our society?” just seems wrong somehow. 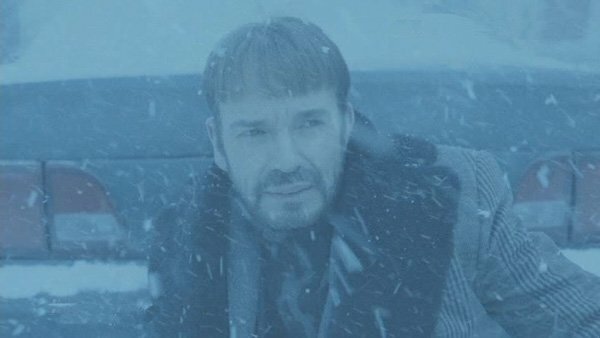 Fargo did, indeed, achieve an almost True Detective-like metaphysicality in that last Blizzard episode. The ambiguous quality of the good; the relentless banality of evil. What happened 10 miles from me is as it seems and as most of these events seem. No question that people are getting more “used to” to these incidents. (I asked our Board president to observe a moment of silence before a Board meeting in recognition. He declined.) It feels to me like we are waiting for a tipping point, where hundreds of innocent are slaughtered in this way, and then people will express their will for change in a way that NRA cannot deflect.